These 17th and 18th century museum reproduction weapons are faithfully reproduced to represent the original. The flintlock guns and firearms shown here are non-firing replicas only and are completely safe and harmless. For Centuries...wars were won and men died by the sword. All of that changed with the invention of the gun. Hand-held firearms had their beings in early medieval times but they were not perfected until the sixteenth century. The knight's shining armor had its swan song during this period. The matchlock, although cumbersome, was the first real useable hand-held gun. A section of match cord burned very slowly and was used to ignite powder in a flash pan, which ignited powder in the barrel sending a lead ball in the general direction of the target. This system had several flaws however. The smoldering match cord was a dead giveaway of your position to an enemy at night. Also, keeping an open spark in very close proximity to open gun powder was very dangerous and resulted in many accidents. The wheel lock gave the marksman a truly modern firearm that was relatively safe and sophisticated. A serrated, spring-loaded wheel, rested against a fixed piece of iron pyrite. When the trigger was pulled it released the tightly wound wheel. This created sparks which ignited the powder in the lock. The wheel lock had its short comings also. Although reliable, it was expensive, complicated and difficult to maintain and repair. 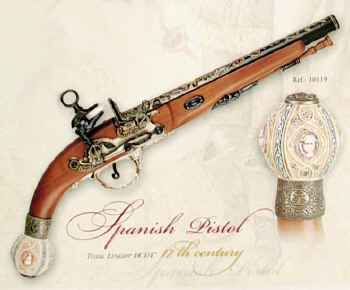 The invention of the flintlock, gave the average foot soldier an inexpensive and reliable firearm that was easy to operate. A small piece of flint was attached to a hammer with a thumb cocking mechanism. A small portion of powder was placed in flash pan. A lock was pulled down over this powder to protect it. When the trigger was pulled, it released the hammer. The flint struck the lock flipping it out out the way of the pan while simultaneously creating a sizeable spark. This spark was sufficient to ignite the powder. Gun makers perfected mass production and delivered consistent quality during this time. This design prevailed for nearly two hundred years... Cartridges and repeating rifles and pistols added firepower to guns as well as accuracy and range. To learn more about primitive pistol and rifle firearms, the History Channel (tm) has produced a program named History of the Gun which is probably the most informative program on the subject. It is available on video tape.